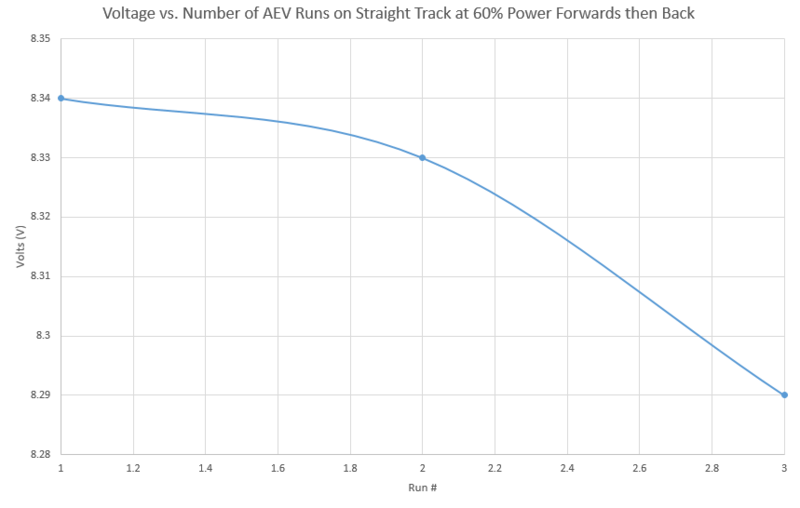 The “Average Volts vs Average Distance of AEV Running Straight Track at 60% Power Forwards then Back” figure above represents the average voltage of the AEV’s battery as a function of the average AEV’s distance traveled across three trials. It should be noted that the AEV started at 60% power in a forward direction, then at tick 1.5 the AEV began slowing itself down, and at tick 3.8 the AEV began reversing direction at 60% power. The “Voltage vs. 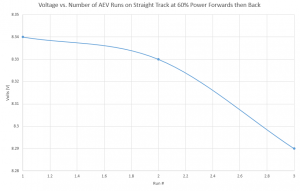 Number of AEV Runs on Straight Track at 60% Power Forwards then Back” figure above represents the voltage used during each of the three trial, as measured by a voltmeter directly following each trial.